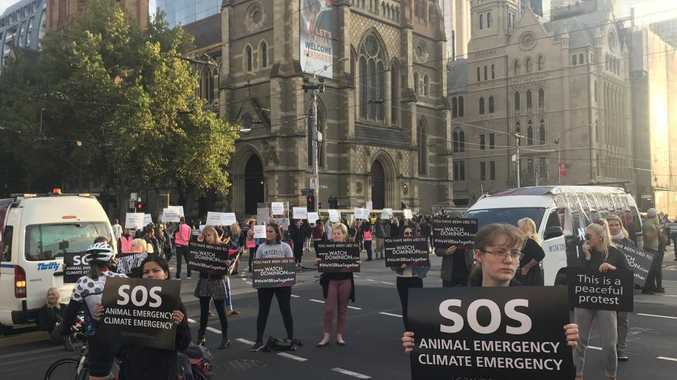 LIVESTOCK transporters are being urged to take care on the roads today as animal activists are conducting the "biggest protest the world has ever seen". The Australian Livestock and Rural Transporters' Association understands simultaneous protests will be held in Sydney, Melbourne, Hobart and the Darling Downs (via Brisbane) and that the exact sites are not known but activists are being advised to arrive in vehicles with full fuel tanks. The documentary, which was released on March 29, 2018 in Melbourne, exposes the "dark underbelly of modern animal agriculture" and is described as a "call to action for anyone who believes in the film's message of a more ethical world". In the events section of the Dominion: Documentary Facebook page, a meet up is scheduled for April 8. The page states they "want people around the world to see that our work for animal rights is no longer a minority grassroots movement but instead a rapidly growing phenomenon that can't be stopped". It stated the "action" would be completely nonviolent and "under no circumstances would violence or retaliation from our side be acceptable". A Queensland Police Service spokesman confirmed police were aware of "planned protest activity". "The QPS respects the rights of people to protest lawfully and peacefully in Queensland, however, also acknowledges the rights of landholders and business operators," he said. "If a property owner has any concerns or should any unauthorised person attend their property, they are encouraged to contact Policelink on 131 444 or Triple Zero (000) in an emergency." Ex-truckie Lachlan MacDonald, who lives near Toowoomba, encouraged truck drivers to post locations of activists if they are spotted to Facebook so it could be passed on to police. Melbourne's busiest intersection was completely blocked off by vegans conducting a "peaceful" peak-hour protest. Nine people were arrested at an abattoir on Mazamat Road at Goulburn, where they had chained themselves to a conveyer. 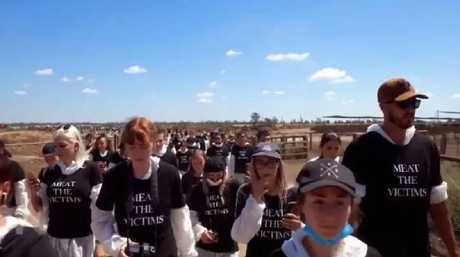 The news comes off the back of a recent vegan attack on Lemontree feedlot and dairy at Millmerran, where more than 100 activists stormed a family farm. Prime Minister Scott Morrison admonished the animal activists as "un-Australian" on 2GB radio this morning. "It is shameful, it is un-Australian," Mr Morrison said. "This is just another form of activism that I think runs against the national interest, and the national interest is being able to farm their own land."